As refugees continue to cross the border from Hungary into Austria, EU interior ministers have failed to reach unanimous agreement on a plan for binding quotas to relocate 120,000 refugees and take the strain off Greece, Italy, and Hungary. In Austria, 500 soldiers are being deployed on the Hungarian border on Tuesday, to help police carry out border checks. Soldiers will also be providing humanitarian assistance in other areas of the country. On Monday night more than 8,000 people were camped out in the border town of Nickelsdorf, hoping to continue their journey on to Vienna. Police said that throughout the day around 20,000 refugees crossed the border into Burgenland, many of whom had been in the Hungarian reception centre at Röszke, which authorities have closed down. In southern Burgenland, a new hotspot has emerged at the border crossing of Heiligenkreuz in Lafnitztal. Some 4,500 asylum seekers were counted in the surrounding districts of Güssing and Jennersdorf. 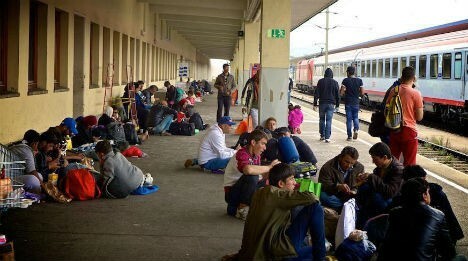 Private convoys and volunteers are continuing to pick up refugees in Burgenland, and drive them back to Vienna to the main train stations – but have been warned to be cautious. A Swedish man who lives in Austria told The Local that on Monday he picked up a Syrian family in Burgenland – a man, two women, and two babies – and drove them to Vienna but was stopped on the city’s outskirts by police who fined him €70 for not having child seats in his car. “They removed the family from the car and aggressively questioned us. They threatened to arrest my wife. They told us ‘that we needed to pay for this’,” he said. The police did not allow him to drive the family into central Vienna, and he does not know where they were taken. Officials at Vienna’s Hauptbahnhof station said on Monday that they had reached capacity “with more than 1,000 refugees” camped out there. Austrian Railways spokesman Michael Brown said on Monday evening that the station would stay open all night long “so that people have at least a roof over their head”. He added that access to the platforms was being controlled and only refugees with a valid train ticket were being allowed to enter the platforms. Germany’s Transport Minister Alexander Dobrindt said on Tuesday that refugees should be able to travel from Austria to Germany on special trains. “This would give us the ability to control the trains, as well as their destination,” Dobrindt said. The EU has agreed to relocate 40,000 migrants from Greece and Italy to other EU states, starting on Tuesday. Germany will take 21.91 percent, and Austria will take 3.03 percent. However, the EU failed to agree on mandatory quotas for a further 120,000 asylum seekers. The Czech Republic, Slovakia and Hungary were reportedly among the nations opposed to mandatory quotas.